A norry or nori (Khmer: ណូរី, from the French word for lorry) is an improvised rail vehicle from Cambodia. Lonely Planet describes it as “Cambodia’s bamboo train”. The trains run at speeds of up to 50 km/h (31 mph) on the metre gauge tracks around Battambang and Poipet. A scheduled service run by the Government also operates, but is slower at 30 km/h around 18 mph. The rest of the network, originally built by the French colonial government, is largely abandoned, after the Khmer Rouge regime effectively shut it down. In 2006 the BBC reported that there was only one scheduled service a week and it ran at not much more than walking pace. In October 2017 the bamboo train was no longer available in the original form due to the national effort to rebuild the rail line from the Thai-Cambodia border town Poipet to Phnom Penh. However, the bamboo train is being rebuilt near Wat Banan in order to cater to the local tourism industry. The relocated site is set to open in middle January 2018. Norries have low fares, and are frequent and relatively fast, so they are popular despite their rudimentary design, lack of brakes, the state of the rails (often broken or warped) and the lack of any formal operating system. Its simple construction and light weight means that a norry can be easily removed from the track – if two meet on the line, the one with the lighter load is removed from the rails and carried round the other. At the end of the line the vehicle is lifted and turned. In August 2016, Norry has been developed with braking system.There is some precedent for the Norry’s popularity. In the 1980s and 1990s, due to the civil war in Cambodia, trains were led by an armed and armoured carriage; the first carriages of the train were flatbeds used as mine sweepers, and travel on these was free for the first carriage and half-price for the second. These options were popular despite the obvious risks.Norry construction is a cottage industry conducted in trackside villages. It takes around four days to construct one of the vehicles, which have a steel frame overlaid with bamboo slats resting on wheels taken from abandoned tanks. Originally propelled by hand using punt poles, power is now provided by small motorcycle or tractor engines with belt drive direct to the rear axle, delivering top speeds of 40 km/h or more. Fuel is bought from villages along the route, supplied in glass jars and the flat-bedded vehicles will carry any load that will fit, including people, livestock, motorcycles and rice. In February 2008 a project was announced to rebuild the railway lines from Sihanoukville to Phnom Penh, Phnom Penh to Poipet and on to Sisophon and the Thai border (a stretch completely destroyed by the Khmer Rouge regime). This was due to be completed at the end of 2009. 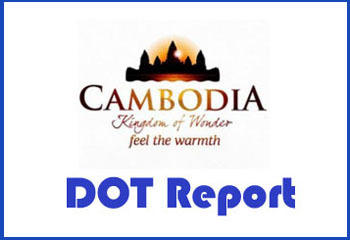 As of May 2011 this project has only completed from Phnom Penh to Sihanoukville. As of May 2011 the bamboo train appears to be the only train operating around the Battambang area, which can be observed by the completely overgrown tracks passing through the city. On the outskirts a tourist service operates for $5 per person to a village that has a brick factory. This is overseen by the local Tourist Police. 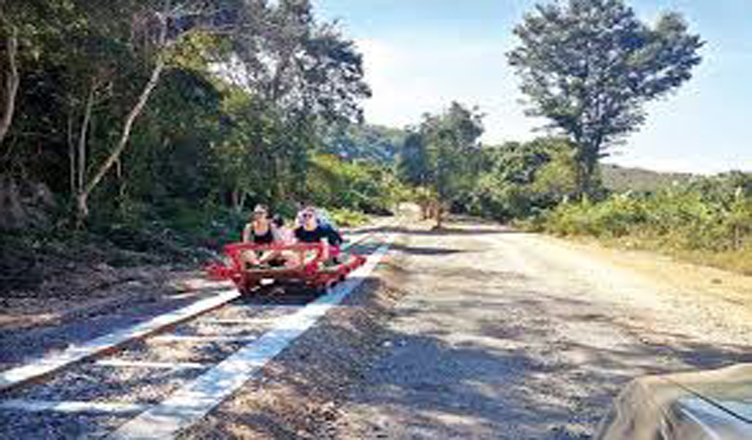 As of January 2014 there is still a bamboo train ride in Pursat, which goes southeast out of the city for about an hour for a fare of $5 per person.